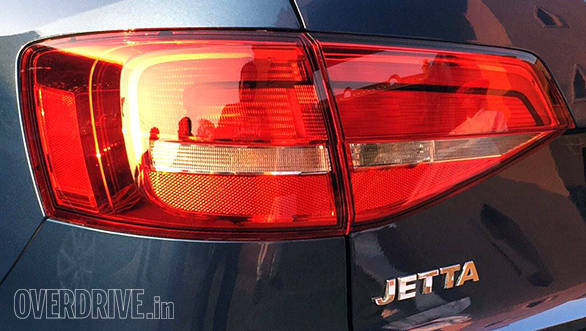 In a year's time Volkswagen will have a brand new MQB-based Jetta ready for the world. 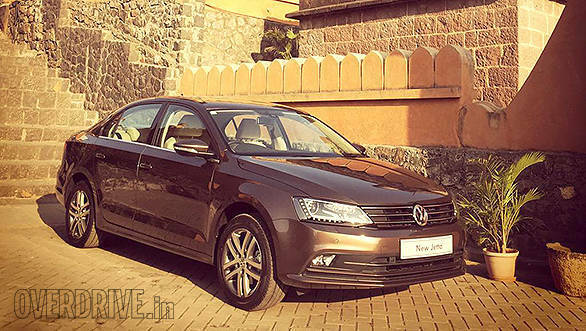 Till that car arrives the company has given the existing Jetta a bit of a nip and tuck in order to keep it relevant. That's the car you see here. As you might expect, the changes aren't many and all of them shall be discussed in the next paragraph. Volkswagen specialise in subtle designs and their midlife refreshes are even more so. At first glance, many might not be able to tell the difference. 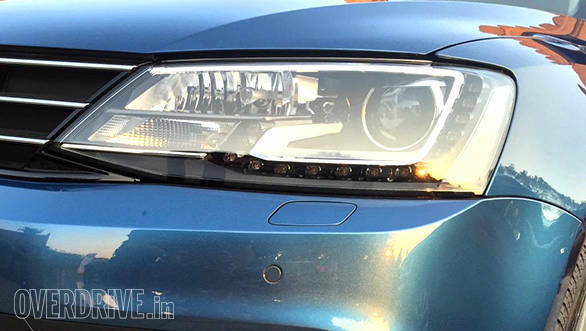 Squint a little and you see that the LED DRL infused (highline only) headlamps meet a nice looking new grille that now gets three wide-spaced chrome slats as against the old grille with two. The bumper gets ever-so-slightly revised air dams as well. The diesel gets different alloy wheels that are held in place with special lugs that can only be opened with the provided spanner while the rear end features slightly more tapered tail lamps. 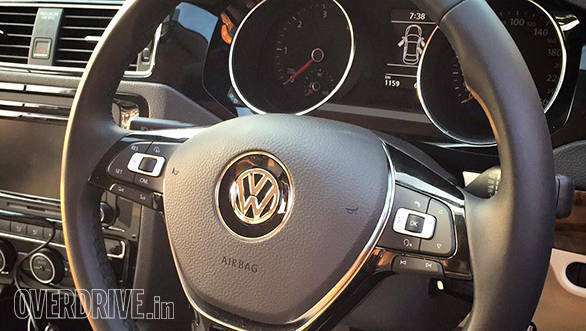 Move to the inside and you will see the tasty new steering wheel from the Polo makes its way here, but this time with paddle shifters (GT TSI/TDI owners, you thinking what we're thinking?). There's also a new driver fatigue detection system that analyses steering inputs and warns if it gathers information that the driver is starting to get tired. Add in some super subtle chrome detailing and there you have it. There's also a new shade of blue that suits the car quite nicely. Internationally this car gets a more powerful 150PS version but here it continues with the same 140PS 2.0-litre turbo diesel. Likewise, the 1.4-litre turbo petrol remains untouched sending its 122 horsepower to the front wheels via a 6-speed manual only. Like before, the diesel comes with a choice of a 6-speed manual or a 6-speed dual clutch automatic. Both engines with both gearboxes remain a pleasure. The petrol is smooth and torquey although it does tend to suffer at very low revs. The diesel while more vocal produces a strong slug of torque and is quite rev happy which makes for an involving drive. The dual clutch automatic is typically good but I love the smooth and slick throws of the manual - easily one of my favourite in the market. Ride quality too is a strong point and the car keeps its passengers comfortable and isolated with very good NVH, comparable with the C-Class we recently if not better. Handling is eager and sure footed while the steering has some heft to it and feels nice and direct. Overall very little has changed with the Jetta and it still remains a solid German driving and luxury experience. It also remains one of the best cars in the segment.